BearShare Acceleration Patch is an add-on for people who use BearShare P2P file sharing utility to download music, movies, books and any other files. BearShare Acceleration Patch provides extra functionality and features to enhance download experience of BearShare application: will automatically speeds up the download process and will find the files you desire with far more power than regular searches. BearShare Acceleration Patch is easy to use. 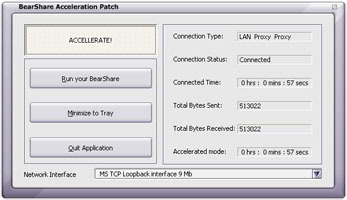 BearShare Acceleration Patch resumes broken downloads, clears downloaded and erroneous ones and saves configurations from last run and automatically loads it on start-up. Has a user friendly interface and BearShare Acceleration Patch is a FREE program. Best thing is that NO spyware or adware are bundled with this great and nice booster - BearShare Acceleration Patch. * Saves configurations from last run and auto loads on start-up. Drive a selected bus out of a crammed parking area. Qweas is providing links to BearShare Acceleration Patch 5.0.4 as a courtesy, and makes no representations regarding BearShare Acceleration Patch or any other applications or any information related thereto. Any questions, complaints or claims regarding this application BearShare Acceleration Patch 5.0.4 must be directed to the appropriate software vendor. You may click the publisher link of BearShare Acceleration Patch on the top of this page to get more details about the vendor.